Lewis Hamilton has emerged from a monsoonal day of practice at the United States Grand Prix with the quickest time on what could be a championship-winning weekend for the Briton. Heavy rain before the start of afternoon practice meant most drivers were unable to improve their laps at the end of the day, leaving Hamilton’s best time of 1 minute 47.502 seconds set in the wet morning session to stand as the day’s benchmark. It was as comprehensive a result for Mercedes as possible in the circumstances, with Valtteri Bottas setting the second-best time in the morning session, though he was 1.3 seconds off the pace. Red Bull Racing’s Max Verstappen and Daniel Ricciardo followed, with title contender Sebastian Vettel fifth fastest ahead of Ferrari teammate Kimi Raikkonen. Drivers kept things mostly tidy in the difficult conditions, but Sauber’s Charles Leclerc triggered a red flag when he lost control of his car and ran through a gravel trap to rejoin the track, spilling stones across the tarmac and requiring a brief clean-up period. The suspension caught out Vettel, who was handed a three-place grid penalty by the stewards for speeding back to the pits. No meaningful long-run simulations took place given the race is forecast to be dry, but similarly rainy conditions are expected to prevail throughout Saturday, making the wet running valuable for the weekend. However, while teams made the most of the damp in the morning, conditions were too saturated during afternoon practice for much representative running to take place. It took until halfway through the 90-minute session for the first car to take to the circuit, with Brendon Hartley taking his first opportunity to find his way around the Circuit of the Americas after he was replaced by Toro Rosso affiliated driver Sean Gelael in FP1. Stoffel Vandoorne followed, the Belgian similarly being substituted for 2019 McLaren driver Lando Norris for the morning session. The pair were quick enough on the drying track to coax Ferrari’s Kimi Raikkonen onto the circuit, but a moment of snap oversteer convinced him to return hastily to the pits. But the track fell largely quiet again until the final 20 minutes of the session, with teams not willing to exhaust their limited allocation of wet-weather tyres given they’ll likely be needed for qualifying tomorrow. All but four cars took to the track but only Toro Rosso’s Pierre Gasly was able to improve on the time he set in the FP1. Lewis Hamilton claimed honours for the session, albeit with a lap more than a second slower than the time he set in the morning. 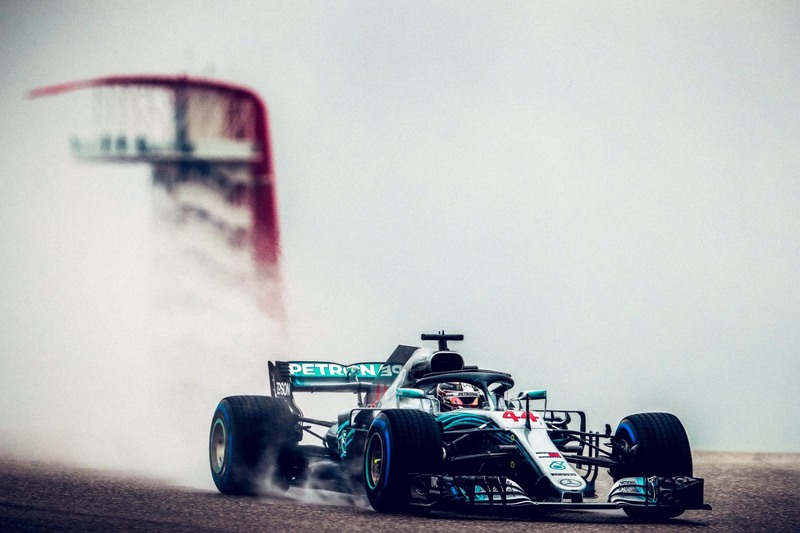 The Briton can claim his fifth championship in Austin if he outscores Sebastian Vettel by eight points or more, meaning victory for Hamilton with his German rival in third or lower would be enough to seal the deal.